Mary Burdon with her card from The Queen. 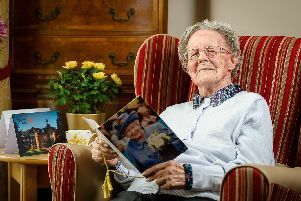 A former nurse who treated victims of the Blitz in the street as bombs fell around her has shared her remarkable story as she celebrates her 100th birthday. Mary Burdon, who now lives at Woodville House in Rugby, was inspired to become a nurse as a teenager when she saw how kind and helpful two nurses were when they moved into the family home to treat her brother. The daughter of an engineer and the granddaughter of a sea pilot, she was a bright child, passing her 11-plus with the help of tutoring from her older brother and attending senior school. In the early 1930s, aged 18, she began training as a nurse in Newcastle. She enjoyed her training, later qualifying in midwifery and becoming a sister in charge of a women’s ward at Newcastle General Hospital. Mrs Burdon became known for being able to tell if a women was due twins. “I would say, ‘ I can feel two pairs of legs’,” she said. During the Second World War Mrs Burdon regularly braved the devastation of the Blitz to give treatment to the injured. While many across Newcastle rushed to take shelter from Luftwaffe bombing raids, Mrs Burdon would have a knock on her front door – which was an ambulance man summoning her to work through the night. Bombing raids on Newcastle killed close to 400 people from 1940 until 1941 – when the raids on the city largely stopped. “We coped all right. I think I had been trained well,” Mrs Burdon said. Mrs Burdon’s husband, Ronald, worked as an engineer. During the war, the firm he worked for transferred him to Rugby. The couple moved to the town and, shortly after they arrived, they received a knock at the door. “I opened the door and there was a vicar stood there in a long black robe. I thought, oh no! Is he here to preach?,” Mrs Burdon said. The vicar was in fact coming to summon Mrs Burdon to the Hospital of St Cross, where she discovered that her help was desperately needed. Mrs Burdon learned that the hospital was in desperate need of staff. “Can you start tonight?” Mrs Burdon remembers the matron asking. Mrs Burdon asked if she could have some sleep first, and then began working as a theatre nurse at the hospital. “I used to say I was the scrub nurse,” she said. Mrs Burdon continued to work as a nurse for all of her working life. She and her husband enjoyed many years of happy marriage, travelling around the world before Mr Burdon died. Mrs Burdon celebrated her 100th birthday on September 30 with family and friends together with residents and staff at Woodville House care home. Staff at the home said it was a privilege to celebrate such a milestone with her.